So I love Heather O’Neill. If you haven’t read her novel ‘Lullabies for Little Criminals’ then you are sorely depriving yourself of great literature. She has another novel out which I have not yet read (will do this) but this book was available at the library first, so I dove right in. ‘Daydreams of Angels’ describes itself as ‘twisted fairy stories’ and that description is very accurate. There are stories about floating babies, talking bears, gypsies, and cloned Russian dancers. Most of them are flights of fancy (as I said earlier, there is a talking bear) but some feature real people and events. This book as a whole, however, was lackluster. Some of the stories I liked immensely: ‘Holy Dove Parade’ is about a girl member of bizarre cult who commits a crime, ‘Where Babies Come From’ is a weird grandmother’s version of natural events, ‘The Gospel According to Mary M.’ is modern story of Jesus’s life in middle school. Most of the stories though I didn’t really like and I struggled through, like ‘The Story of Little O,’ which I’m still not sure what it was about. Out of all 21 stories here I only liked about 5, the rest didn’t make much of an impression on me. The voice was too monotone, the plots too similar. All in all: meh. 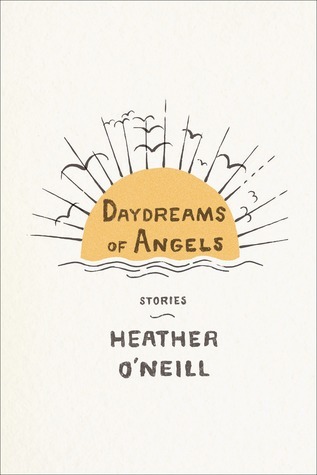 I DO recommend reading Heather O’Neill, but don’t start here. Try reading “Lullabies for Little Criminals” and you’ll thank me for this later.